Wasn’t it yesterday that Y2K was going to turn all of the computers on the planet into a techno-version of Planet of the Apes and civilization was going to implode into anarchy of zeros and ones? Hard to believe we are 15 years into the 21st century. And in case you have been traveling off-planet for the last decade or so, marketing has changed. So, here’s your April 2015 marketing exam. What is the preferred mode of marketing communication to consumers these days? That’s right – email. That wasn’t so tough. 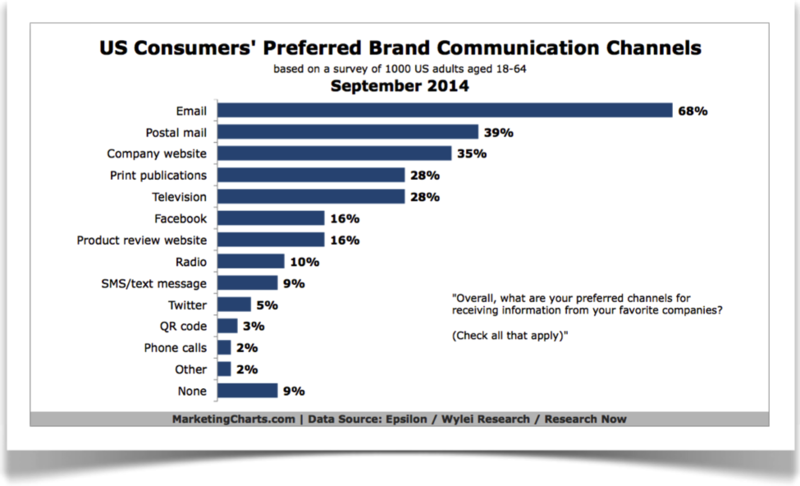 A survey conducted by Marketingcharts.com reveals that email is the preferred communication channel by a wide margin. 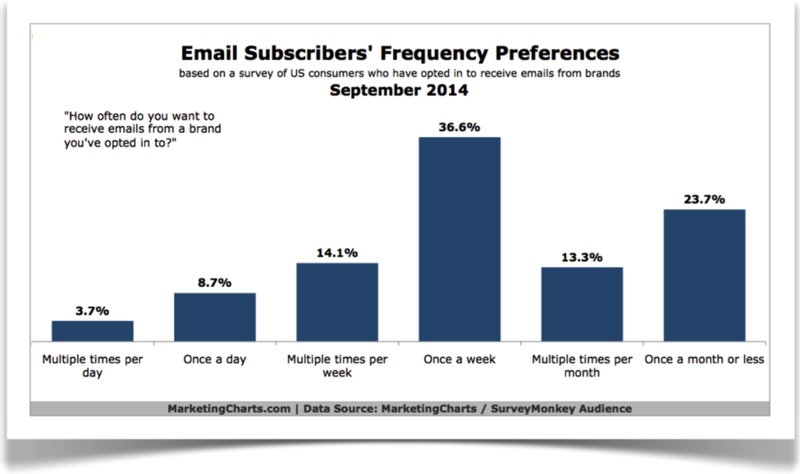 How often should you send emails to your list? The answer is not more than once per week, and ideally a bit less frequently than that. 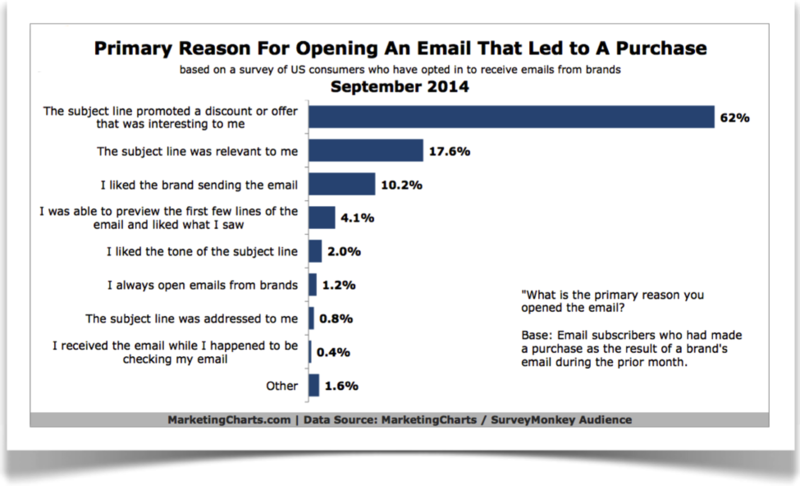 Almost three quarters of respondents wanted to receive emails from brands once a week or less often. And, most importantly, what should you say? You promote a discount or make an offer that would be interesting to your prospects. That’s right: while the world has morphed into a cyber cacophony of zeros and ones, your customers and prospects still want and old fashioned deal, a “discount”. But exactly what discount or offer do you put into the subject line? Ah, that’s where we come in. We conduct surveys of your public to find out exactly what would motivate them to open that email, read your offering and click on through to your site. You don’t need me to tell you it is a digital world today. But it is your customers and prospects that will tell you what offering they need and want and consider valuable. Surveying customers and prospects can often turn up information that will surprise you. For instance, what days of the week get the highest open and click-through rates? Conventional Internet marketing “wisdom” has long held that Tuesday is the best day for response to email marketing promotion. But this same Internet marketing study by marketingcharts.com, which cites a survey by Experian Marketing Services, revealed that highest open and click through activity occurs…on the weekend. That’s right. Saturday and Sunday out perform the more traditional “work days” when it comes to opening and responding to email marketing promotion. Not a surprise when you think of it, as office pressure subsides on the weekends and people have a bit of quiet/personal time to read and respond to emails. Yet, the reality is that email, and other forms of electronic communication, have so blurred the line between office hours and off duty hours many find themselves “on post” 16 hours a day. In fact a survey conducted in May of 2013 by GFI software of 503 U.S. employees found that 81% of them check their work email on weekends. And, 55% of those surveyed check their work email after 11PM. But it doesn’t stop there. Oh no. If you saw the romantic comedy Wedding Crashers with Owen Wilson and Vince Vaughn who play a couple of divorce mediators who crash weddings to pick up women, you know where I’m going. If you haven’t seen Wedding Crashers, get it on Netflix or Hulu. It’s very funny. Not to give away the plot if you haven’t seen it, but there is a point where Owen Wilson and Vince Vaughn’s characters have a falling out. And Owen goes to see the “Godfather” of wedding crashers, Chazz, played by none other than Will Farrell. And Chazz has evolved. Chazz is no longer crashing weddings to pick up chicks. He’s crashing funerals. Which brings us back to our story. Because the survey of 500+ U.S. employees found that 10% of the respondents admitted to checking work email at a child’s school event, 9% at a wedding, and, in a tip of the hat to Chazz, 6% checked their emails at a funeral. But emails have trumped even the mighty Chazz because 6% of the respondents said they logged into their work email while… their spouse was in labor! I digress. My point is that you don’t fully know how your prospects might behave or what they consider to be important until you ask. And how you ask is important. There is a technology to this and we will design the survey questions so you get real, gut level, answers. But the point is, why guess? Why spend precious marketing dollars without knowing for sure? Ask your prospects what they want. They’ll tell you. By all means, use email marketing. Don’t send more than once a week. Conduct some surveys to find out what your public really wants from you and craft a special deal or discount around that. Try sending your emails Friday evening so your prospects can read them over the weekend. Monitor your results and compare them to previous offerings and fine tune as needed. “I am quite pleased with the results gotten from using the program which On Target Research developed for me….The future looks quite bright – predictably bright.” CR Owner.